"Offers focused black fruits with notes of licorice and florals in the nose. The palate shows excellent balance and finesse with lilac, dark cherry and spice, elegantly proportioned. Riveting wine." Fermented in small (0.75 ton) fermenters. Three to six day cold soak and then inoculated with Assmanshausen yeast. One punchdown a day (by hand). Racked once after ML completed. You've heard the hype... but is 2012 really that good? With regards to Californian Pinot Noir, Jim Laube's comment in the Feb 28, 2013 Wine Spectator was: "The 2012 vintage should be stunning, perhaps the best yet." But is Jim right? In a word: YES! So far, based on how the fruit looked when it came in from the vineyards and from how the wines taste in barrel, I think it's safe to say that 2012 will easily be considered one of the best vintages for Cali Pinot - if not (as Jim says) The Best Ever. Near perfect weather and decent yields combined to create both great wines and reasonable supply. We haven't seen that combination since 2009, which is the vintage I think the 2012s will most resemble. And if you remember our 2009s, that's definitely a very good thing. And we're another year better at doing what we do. So it's not a stretch to say Best Ever for 2012 this early in the game. All meats ranging from traditional Pinot pairings (such as Salmon, Ahi Tuna, Pork, and Duck) to heartier fare such as Beef and Lamb. My name is Brian Loring and my obsession is Pinot Noir. OK, I'm also pretty crazy about Champagne, but that's another story. While in college, I worked at a wine shop in Hollywood (Victor's), where one of the owners was a Burgundy fanatic. So, my very first experiences with Pinot Noir were from producers like Domaine Dujac, Henri Jayer, and DRC. Needless to say, I found subsequent tasting safaris into the domestic Pinot Noir jungle less than satisfying. It wasn't until I literally stumbled into Calera (I tripped over a case of their wine in the store room) that I found a California Pinot Noir that I could love. But it would be quite a while before I found someone else that lived up to the standard that Josh Jensen had established. I eventually came to understand and enjoy Pinots from Williams Selyem, Chalone, and Sanford, but I really got excited about California Pinot Noir when I met Norm Beko from Cottonwood Canyon at an Orange County Wine Society tasting. My philosophy on making wine is that the fruit is EVERYTHING. What happens in the vineyard determines the quality of the wine - I can't make it better - I can only screw it up! That's why I'm extremely picky when choosing vineyards to buy grapes from. Not only am I looking for the right soil, micro-climate, and clones, I'm also looking for a grower with the same passion and dedication to producing great wine that I have. In other words, a total Pinot Freak! My part in the vineyard equation is to throw heaping piles of money at the vineyard owners (so that they can limit yields and still make a profit) and then stay out of the way! Since most, if not all of the growers keep some fruit to make their own wine, I tell them to farm my acre(s) the same way they do theirs - since they'll obviously be doing whatever is necessary to get the best possible fruit. One of the most important decisions made in the vineyard is when to pick. Some people go by the numbers (brix, pH, TA, etc) and some go by taste. Once again, I trust the decision to the vineyard people. The day they pick the fruit for their wine is the day I'm there with a truck to pick mine. Given this approach, the wine that I produce is as much a reflection of the vineyard owner as it is of my winemaking skills. I figure that I'm extending the concept of terroir a bit to include the vineyard owner/manager... but it seems to make sense to me. The added benefit is that I'll be producing a wide variety of Pinots. It'd be boring if everything I made tasted the same. 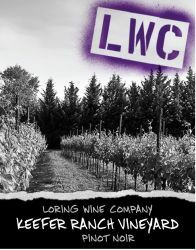 Sounds pretty straight forward, last name Loring, therefore Loring Wine Company. Ahhh, but what about the "Wine Company" part? That is an hommage to Josh Jensen at Calera... which is actually Calera Wine Company. Since he was the guy who showed me that great Pinot Noir could be made in California, I decided to name my winery Loring Wine Company to "honor" him. Hopefully, Josh sees it for what it is and doesn't want to sue me for trademark infringement!